Lava in collaboration with Vodafone-Idea Limited to provide attractive benefits on recharge of Rs.348. 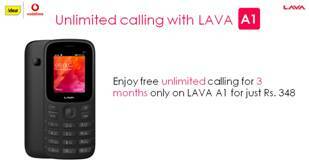 Lava International Limited is introduced exciting offers for Lava A1 customers in association with Vodafone-Idea Limited, the largest 2G telecom entity in India. Lava A1 has been a strong revenue generator for the company and Lava International sees this collaboration with Vodafone Idea Limited to further provide exciting benefits to all its A1 users. Under the scheme, the owners of Lava A1 can recharge for Rs.348 to enjoy unlimited local & national calls even on roaming for 84 days. This prepaid recharge also provides customers with 100 free SMS per day. New customers coming on Vodafone-Idea network can avail the same benefits with the first recharge of Rs. 351. Lava delights A1 users with 3 months of Vodafone-Idea unlimited talk time 0 out of 5 based on 0 ratings. 0 user reviews.